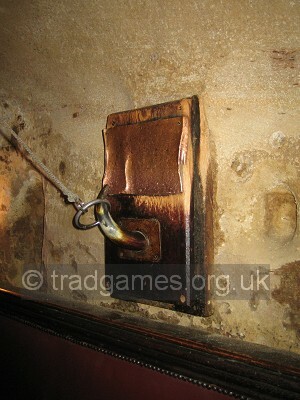 This is an indoor game the aim of which is to swing a metal ring which is dangled from the ceiling on a rope, onto a metal hook on the wall. Originally, the hook was a bull's horn. Quite often the hook is embedded in the nose of the head of a bull on the wall. Other variants exist featuring other animals such as stags and pigs. The game is one of the oldest in the country; legend has it that it was brought back by Crusaders from Jerusalem. 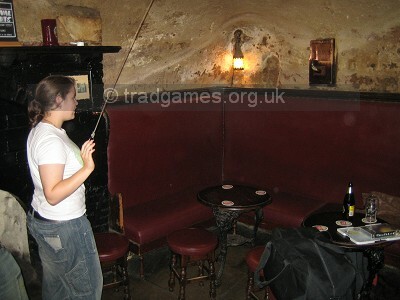 The story appears to have come about primarily from the most famous pub featuring the game - the venerable "The Trip to Jerusalem" situated in the cliffs underneath Nottingham castle. This pub is an old crusaders tavern dating from 1189 and so the legend certainly is not without merit. Left top is pictured Ringing the Stag!. By kind permission of Arthur Taylor. Left middle and left bottom is Ringing the Bull found at Ye Olde Trip to Jerusalem in Nottingham. This pub is one of at least 5 pubs that claim to be the oldest in Britain and is worth a visit even regardless of the game. The game is also played in and around the Caribbean where it is known by several names and often has a nautical theme and one is required to ring a fish! Various theories for its origin are espoused - some say it was introduced by Pirates, other say its inventor was Ernest Hemingway! However, the earliest confirmed documented reference found for the game is from England in Men of Character by D. Jerrold, 1838, in which is written "After that, he must visit the gypsies; then he must ring-the-bull" and "There is first the lucky-bag-then the sticks-then the ringing-the-bull-then the round-about". The game is so simple that many pubs stage it simply as an informal pastime rather than as a competitive game. A person will make a a number of attempts to ring the bull and then pass the ring to somebody else for a turn. The basic throw is simple a swing in a clockwise direction (for a right handed player) straight onto the ring but advanced players can also ring the bull across themselves in an anti-clockwise direction. 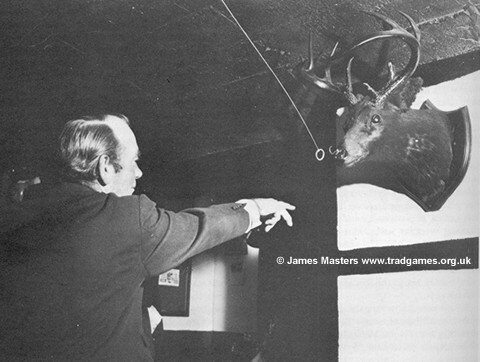 Old hands are able to throw with either hand in either direction and will then really impress their spectators by facing away from the hook and swinging in the opposite direction such that upon its return the bull is ringed. For extra difficulty, they might do this while standing next to the target instead of at the usual throwing mark. The ultimate throw is one which circles the room completely twice and then lands squarely on the target. Difficult yes, but not impossible! 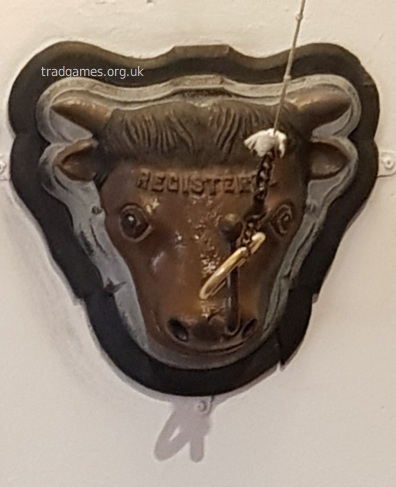 This Ringing the Bull appears to be a manufactured version and as at 2019 was being played at the Sheffield Arms in Burton upon Stather. If anyone knows anything about it, please let me know. With thanks to Keiran Stannard. Here's a Ringing the Bull video taken in the Tower Arms, Brentwood. As far as we know, Masters Traditional Games is only company that makes a version of of Ringing the Bull. Please see the separate Ringing the Bull Pubs page.